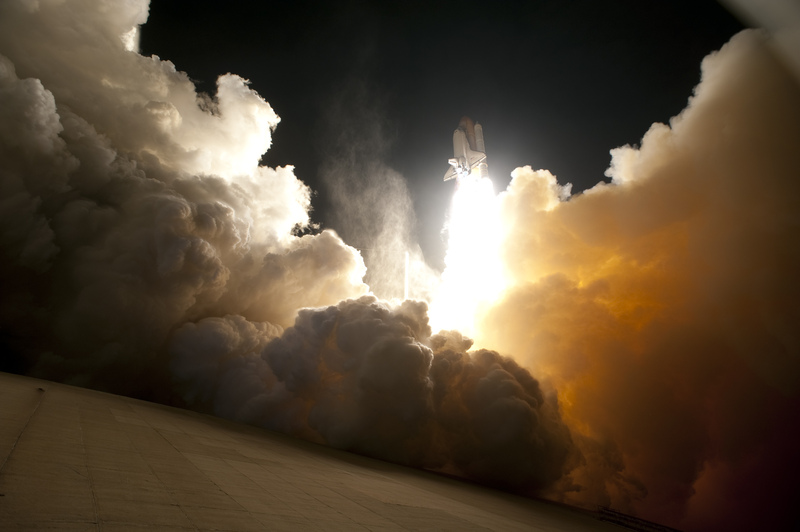 Explanation: Sometimes, the space shuttle launches at night. Pictured above, the space shuttle Endeavour lifted off in yesterday's early morning hours from Launch Pad 39A in Kennedy Space Center, Florida, USA, bound for the International Space Station (ISS). A night launch, useful for reaching the space station easily during some times of the year, frequently creates vivid launch imagery. The shuttle, as pictured above, is framed by an enormous but typical exhaust plume ejected as the shuttle's powerful rockets began lifting the two million kilogram space bus into Earth orbit. Endeavour's mission, labeled STS-130, includes the delivery of the Tranquility module to the space station. Tranquility will provide extra room for space station astronauts and includes a large circular set of windows designed to bestow vastly improved views of the Earth, the night sky, and the space station itself.